View from Kitchen. New ceiling installed (not popcorn). Ceiling fan keeps cool. New windows with screens & curtains. Ceiling fan for coolness. Lavatory separate to vanity/sink area to reduce contention :-). Shower on right. Lockable steel screen front door to use during the day to enjoy the cool breeze! Stacked washer and dryer in closet. Left pic shows closed. Right pic shows open. Another ocean view photo from lanai. TIP: Moonlights are as awesome as sunsets. Sandy-bottom, warm-water, Kamaole Beach Park II, 200 steps from our Akahi condo!! Clean, quiet, well maintained, upgraded, peaceful, beautiful condo with ocean view for sunsets, moonlights, and rainbows. Located on the gorgeous landscaped grounds of Kihei Akahi in the superior, sunniest, most quiet & secure building D, across the consistently best rated swimming beaches of Maui. The sandy-bottom Kamaole Beach I, II, & III are two skips from Kihei Akahi and are watched over by lifeguards and backed by picnic benches. To complement the pristine beaches you also have the two on-site, guest-only, secure, clean, swimming pools! Don't forget to go through each of the captioned photos that tell their own story... Mahalo! Super clean & comfortable, a fantastic location! We've been to Maui (Kihei) several times and always enjoy our time. Kihei Akahi is perfectly located, right across the street from Kam II Beach Park and a short walk to several decent food & drink establishments - and of course a coffee stand! We arrived late evening and the directions that the owners provided us directed us right to the property, the parking spot, and the unit without any confusion. Daniel was very attentive (but not too attentive) to make sure we found everything immaculate and to our liking. It is clear that they care about their home here and want their guests to have everything they need. Though we didn't use the pool much or the poolside BBQs, we saw the staff there each morning to scour everything down and get things prepared for the guests to enjoy. The grounds were very well maintained. We also enjoyed running from the property into Wailea and along the beach path there. Early mornings are the best as this is a very popular route! A week in paradise in the PERFECT SPOT! The location is simply spectacular. 5mins to the Kamaole II beach - perfect location to watch sunsets on the ocean. The condo is superbly managed by Daniel and Jenny. Any questions we had were answered almost immediately - I seriously couldn't have asked for a better response time. Although, truth be told - Daniel took so much time and effort to prepare information prior, during, and even after our stay at the condo. We were not lacking any information at all about what to see, do, and enjoy while being in Maui. The condo was immaculately clean, stocked with any necessities, and had plenty of gear for numerous beach activities. There is a 50m FREE pool close by and plenty of shops, restaurants, etc. Yoga on the beach every morning, free water aerobics at the pool, bike rentals, etc. Location couldn't be better for access all along the western coast of East Maui. Highly, highly recommend. Already planning our return visit ... Thanks Daniel and Jenny for helping make our stay so enjoyable. My husband and I visited Maui for our honeymoon and we had an awesome time! We love Maui and I highly recommend staying in Kihei or even staying at Daniel's condo. 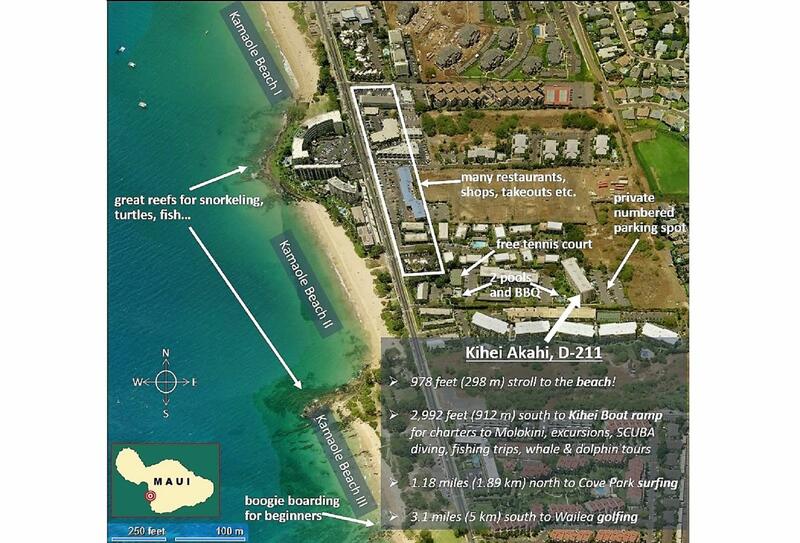 The condo is centrally located in Kihei with a couple restaurants and beaches within walking distance. The staff was also very friendly and helpful on the property. The condo was perfect size for two people, I don't recommend more than two, it might be a little crowded. Everything was nice at the condo. I liked that beach towels, two beach chairs, a small cooler, snorkel gear and other beach accessories were available to use. Daniel was very helpful though the whole planning for this trip. He answered all my questions very fast, mostly within the same day. Daniel also gave us recommendations that were going on locally that week or things Maui was known for. I also liked that the condo wasn't really far from the airport, about 35-45 min. We will definitely be back to visit! Thank you so much Daniel! You were an excellent host! Great time, amazing hosts, and a slice of heaven in Kihei Akahi! My husband and I had a great time. The owners were incredible and responsive about making our vacation experience a great one! The location was perfect, quiet and yet so close to the beautiful Kamaole 2 Beach. Gourmet kitchen was a pleasure to be in. Condo was well equipped and clean. The view from the balcony was beautiful. We enjoyed our coffee in the in the mornings, relaxed in the late afternoons and of course, enjoyed our late night drinks. Either grilling steaks on the bbqs by the pool, or going out for dinner to the many resturants within walking distance. Taking our evening walk to watch the spectacular sunsets every night. Or going to our favorite ice cream store, we loved it all! You cannot beat the location, Kihei Akahi has made our vacation even more special. Thank you Daniel and Jenny for everything and making your home our temporary home. Your place is awesome! We will be back God willing. We have stayed at many different condos in Kihei and this one is by far our favorite and is one that we would book again for our next trip! Right from the start, Daniel was very responsive to emails and any questions we had were replied to very quickly. 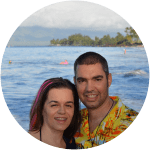 During our stay, he sent us a few emails with some ideas of things to see or do, and even though we have visited Kihei a number of times, it was nice to know he was thinking of us and wanted us to enjoy our stay. The kitchen is well appointed with efficient trouble free appliances. The internet is the fastest we have ever had at a rental condo or hotel. As I need to work while on holidays, this meant more time for beach and less time working. Speaking of beach, the Tommy Bahama chairs and umbrella along with a couple of boogie boards were great to have use of. We had our own snorkel gear, but there is some provided if you don't. You don't have a panoramic ocean view, but we were treated to a whale slapping it's tail at sunset one of the evenings in clear view from our Lanai. We spent a great deal of time there for meals or just the watching the sunset. It is was clear from the start that Daniel wants his guests to enjoy themselves and feel at home away from home. We stayed for 3 weeks+ and the condo had everything we needed for our stay. The only reason I would have for not recommending this icondo is that you might book it before I get a chance to for my next visit! And you will recommend it to your friends and so on. Thank you Daniel for sharing your wonderful home in paradise with us! Daniel and Jenny have known each other since 1993. They've lived in various European countries before emigrating to Seattle (WA) where they've been living since 2008. Daniel works at Microsoft, and Jenny is also a software developer. They have visited all the Hawaiian islands and fell in love with Maui, and specifically Kihei. 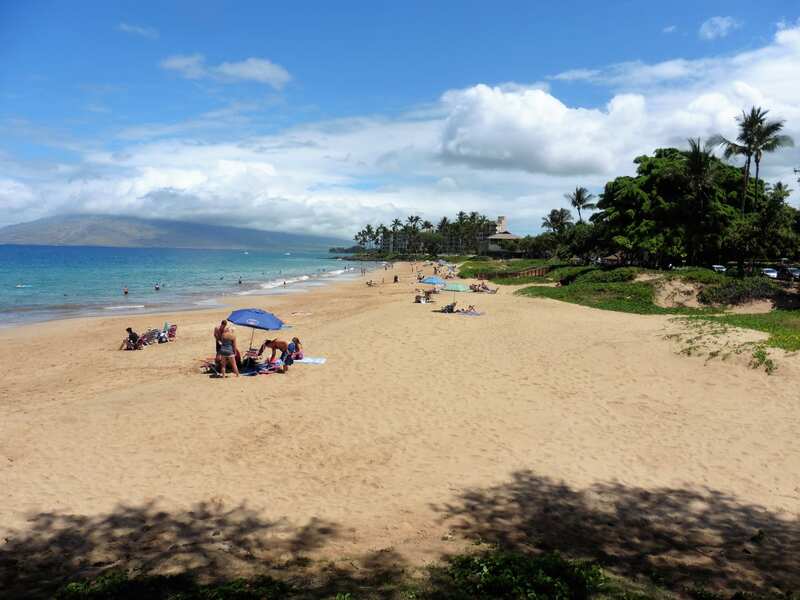 Kihei is the driest, sunniest of all of Maui, and it has the best underwater world with many dive/snorkeling sites including Molokini - a short trip from Kihei Boat Ramp. It is also very walk-able, and when you choose to drive you can find car parking easily (unlike other places on the island...). We visit the island 2-3 times a year for 10-15 days each time, boogie boarding in Kamaole Beach III, snorkeling between Kamaole Beach I and II, and sometimes walking further south to Keawakapu Beach or driving to Big Beach. 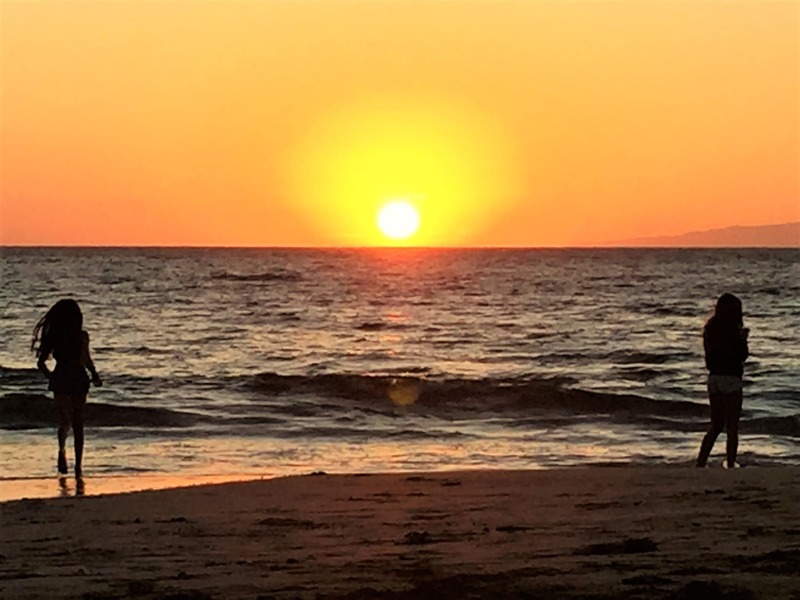 We try to eat all our meals on the lanai, watch the sunset every single day, and stroll up and down S Kihei Rd after a game of tennis or other activity... We sometimes get asked why we chose Kihei Akahi? In a nutshell: Proximity to beach, ocean view, minimum noise, safety, privacy, affordable paradise lifestyle. 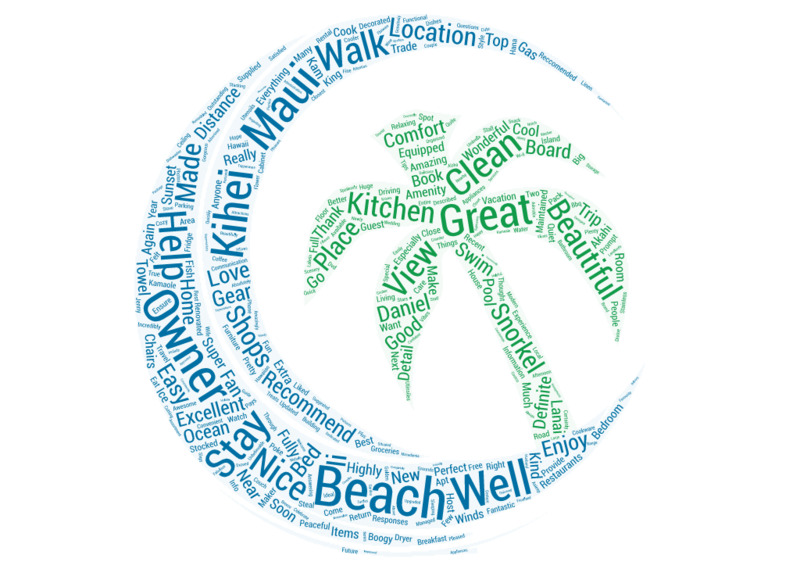 When choosing our Kihei condo the most important criteria was that it had to be somewhere across from Kamaole Beach I, II, or III - there is little point in travelling all the way to Maui and not be able to walk a few steps and be on one of the Top 5 beaches in Maui. Second criterion was Ocean View even from inside the unit - if you are going to be so close to the sea, why not be able to see it! Then for units that met those criteria, there were factors that eliminated some of them. For example, ground floor units, because of the reduced privacy and safety, plus bugs can sometimes be an issue, so we wanted a higher floor. We also eliminated units that were directly on Kihei Rd, because the traffic noise seems to get trapped in those units, we wanted a quiet place. 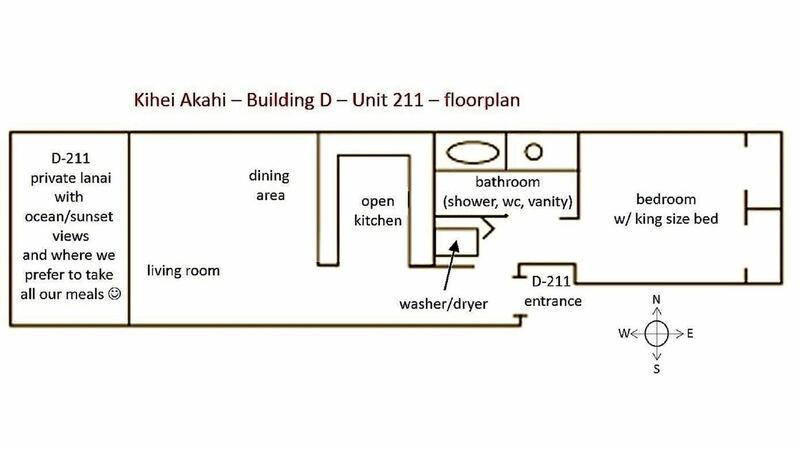 Finally, we were on a budget, and the value for money that we found in Kihei Akahi is unmatched... reflected in the advantageous rental prices of Kihei Akahi units compared to other condominium complexes. Another feature of Kihei Akahi is that it has solid concrete walls and construction, whose benefits include better noise insulation from neighbors, and better temperature characteristics. Its two swimming pools, nicely manicured grounds, tennis court, and outside grills for BBQing were all bonus features!